The Supreme Court has refused to overturn a ban on “gay conversion” therapy, and Democratic lawmakers recently introduced a bill that attempts to ban the practice at the national level — both legal moves that have advocates cheering. 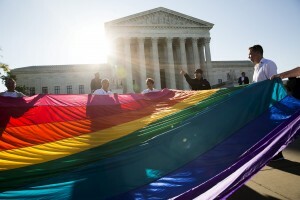 The Supreme Court declined to hear a case Monday challenging California’s ban on gay conversion therapy. Because a lower court ruled in California’s favor, the ban will remain in place. The decision comes after years of legal proceedings against California’s 2012 law, which outlawed state-licensed medical professionals from performing “gay conversion” therapy to change a minor’s sexual orientation. The Supreme Court previously refused to hear an appeal in 2014, rejecting claims that the law infringed on free speech. In a 2012 challenge, conversion therapy supporters challenged the law on the grounds of religious freedom. The U.S. 9th Circuit Court of Appeals ruled in favor of the state in both cases. LGBTQ advocates hailed the Supreme Court’s decision on Monday a victory, but opponents of the law vowed to bring new court challenges. “We are deeply disappointed by today’s announcement, because it means young people in California and elsewhere will not be able to get the professional help they seek, due to political correctness,” said Brad Bacus, the president of Pacific Justice Institute, which brought the lawsuit. Democratic lawmakers, meanwhile, want to expand the ban nationally. Democratic congressman Ted Lieu — who authored the California ban five years ago as a state senator — introduced the Therapeutic Fraud Prevention Act, along with Sens. Patty Murray, D-Wash., and Cory Booker, D-N.J., last month. The bill seeks to expand the ban conversion therapy nationwide and uses the same arguments of a 2015 case that found a New Jersey non-profit’s conversion claims and practices to be fraudulent. The proposal brought accolades from the LGBTQ community. “Now more than ever, we must send a clear message to the LGBTQ community — and especially LGBTQ young people — that who you are is not something that needs to be fixed,” Human Rights Campaign president Chad Griffin said in a statement praising the bill. The American Psychiatric Association completely removed homosexuality as an illness from the Diagnostic and Statistical Manual in 1987, but no bills explicitly banning the practice were introduced until 2012. Conversion therapy is also banned in Oregon, New Mexico, Illinois, New Jersey, Vermont and the District of Columbia.